The striker has admitted repeatedly punched John Friel after a night out in Glasgow. Scotland footballer David Goodwillie has admitted assaulting a man after a former team-mate was subjected to a "cowardly and brutal" attack. The Blackburn Rovers striker repeatedly punched John Friel after a night out in Glasgow city centre in November 2010. He attacked Friel after learning the 23-year-old had knocked out his then Dundee United teammate Danny Swanson. Goodwillie had been due to stand trial st Glasgow Sheriff Court on Monday, but pleaded guilty to the charge. He had been on a night out with fellow Tannadice players at Karbon nightclub before they went to the nearby Oko Express restaurant in the early hours of November 3. Friel - who was not known to the footballers - interfered as Danny Swanson took a photo of a teammate with a customer. This sparked a confrontation outside and Friel punched midfielder Swanson. Prosecutor Joe Stewart told how Goodwillie came to his friend's aid before learning Friel had been the culprit. Mr Stewart added: "The accused made his way across Queen Street to approach Friel. He was partially restrained by a friend, but managed to break away losing his shirt in the process." The footballer smacked Friel before punching him five or six more times on the head and body. The court was told Goodwillie also aimed a kicked before Friel staggered away. Mr Stewart said Goodwillie appeared "emotional" before police turned up and detained the Scotland star and a number of others. Friel was given 240 hours of community service last August after he admitted to the assault on Mr Swanson. Goodwillie's QC Donald Findlay said Friel's attack that night was "cowardly and brutal". Mr Findlay told how Mr Swanson had a medical condition and his friends were worried being hit could endanger his life. The advocate said Goodwillie was "clearly very angry" at what had happened and confronted Friel who he said was standing about "bold as brass". Mr Findlay went on: "Mr Goodwillie accepts that this type of behaviour was not justified. It was largely driven by genuine concern for his friend who was in some distress. His (Swanson's) life, for all that was known, could have been at risk." 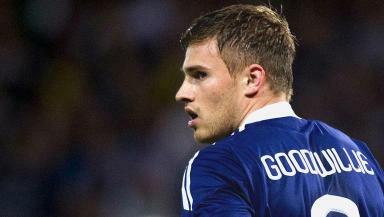 Goodwillie will be sentenced later this month. The player joined Blackburn from Dundee United last August for £2m. He has also won three caps for Scotland.